What is a Baseline plan? A baseline plan is a read-only copy of your working plan that you can refer back to as the financial year progresses. You should save a baseline once you’ve built your working plan for the coming year. You can then use it to compare to your working plan in reports like the Variance or YTD comparison. Click on the three vertical dots on your working plan. What is the difference between a baseline with actuals and one without? If you have a working plan for a future financial year i.e. 2019/20, it will only contain budget items, and no actual transactions. This means that when you save it as a baseline, the entire plan will be set to read-only and can’t be altered - nice and simple. if you have a working plan for a past or current financial year such as 2017/18, it will include a combination of actual transactions up to revision date and budget items for the remainder of the year. When you save this plan as a baseline, the actual information can potentially change. This is because the information comes from the Actuals screen, through bank feeds or manually imported/entered bank transactions. How can a baseline with actuals change? A baseline is saved before entering all transactions for the period into the Actuals screen. 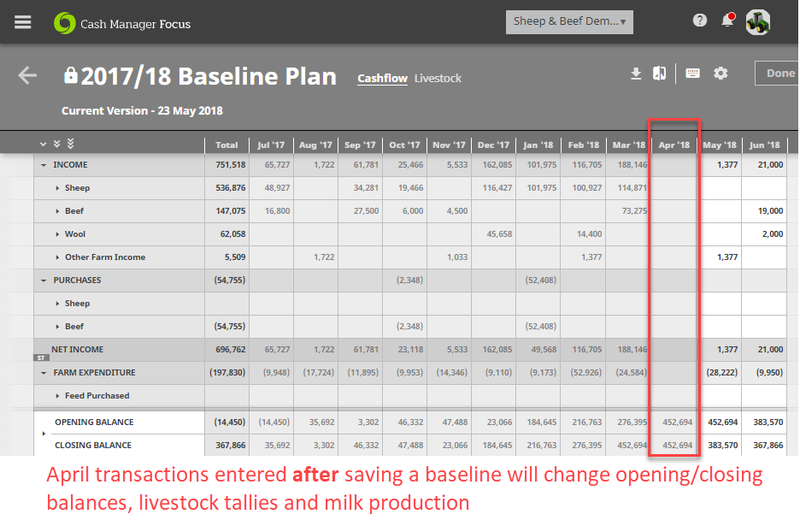 NOTE: Changing the code on a transaction can change where it sits in the baseline but won't necessarily change bank balances, milk production or livestock numbers.